This is an easy and tasty chicken meal, perfect for a busy day. 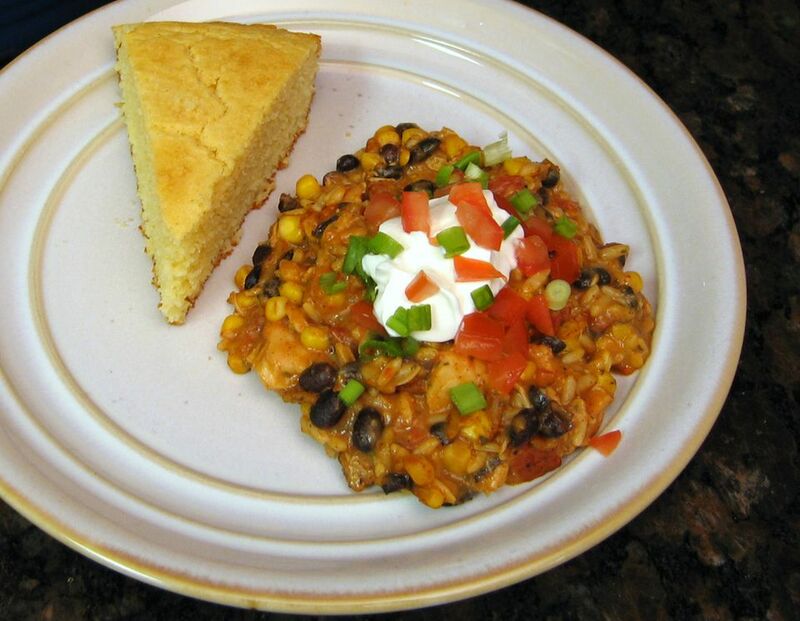 This southwestern chicken casserole is made with diced chicken, black beans and corn, cooked rice, and seasonings, along with an easy homemade sauce and optional cheese topping. In a large bowl, combine rice, chicken, beans, corn, tomatoes, cilantro, cumin, garlic powder, oregano, chili powder, and hot pepper. Stir to blend. In a saucepan, melt butter over medium-low heat; stir in flour until well blended and bubbly. Gradually stir in milk, chicken broth, and salt and pepper. Cook, stirring constantly, until thickened and bubbly. Stir into the rice and chicken mixture. Taste and adjust seasoning, adding more salt and/or pepper as needed. Spoon into a lightly buttered 2-quart casserole. Bake at 350 F for 25 to 30 minutes, or until bubbly. If desired, sprinkle with the cheese about 5 to 8 minutes before done. Serve with a dollop of sour cream and chopped green onions and tomatoes, if desired.